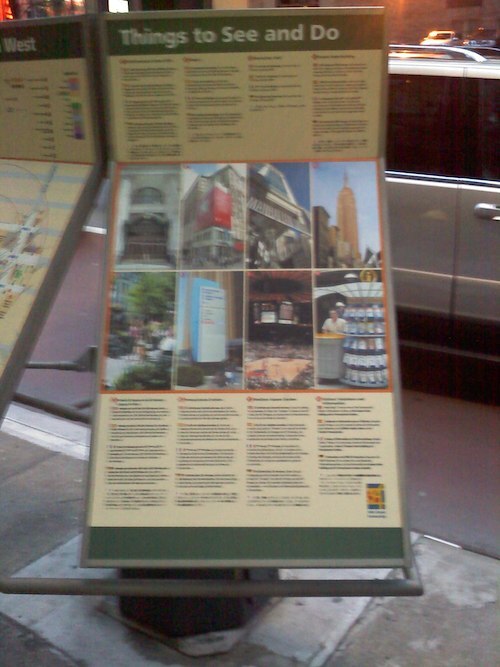 Anyway, while leaving the theater and walking west on 34th Street to 9th Avenue, I came across this brand new kiosk called “Things to See and Do”. In this case it’s for the area called “Penn Station West” (not exactly a must-see on most tourist maps). This thing is a major piece of hardware and a significant investment. It was placed by the 34th Street Partnership, an organization working to revitalize a 31 block area with security, signage, sanitation, street improvements, and tourist assistance. Funds are collected by the city from property owners and distributed to the organization. I’ve always found that NYC was light on tourist-friendly signage, particularly compared to European capital cities that just seem to invest a lot more in helping visitors find their way around. So I found this to be a welcome addition to the neighborhood. 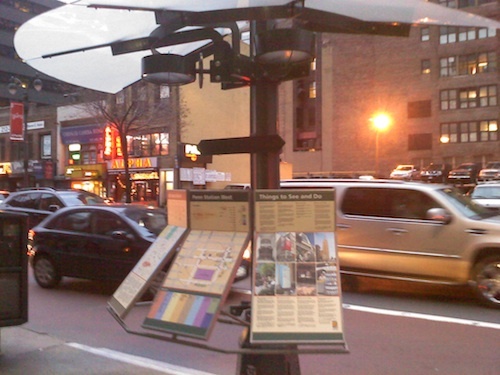 Not sure how many more of these are planned (or installed), but it would be great if the city did more of this.